This June, BIO BEAUTÉ by NUXE (of cult classic Rêve de Miel Lip Balm fame) is launching a new range of certified organic body care. The range will consist of three products and today I have two to share with you. The main ingredient that remains consistent throughout the line is Corsican Citron extract which apparently has excellent toning properties. 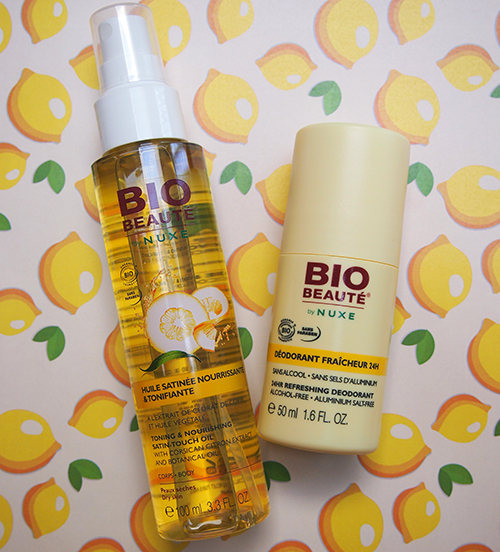 Created by macerating the whole lemon in an organic sunflower oil for 12 hours, the Oil Extract of Corsican Citron used in all the products contains essential fatty acids and anti-oxidants to totally treat your skin. The Toning & Nourishing Satin-Touch Oil absorbs quickly, providing nourishment and leaving skin with a satin feel. I don't really like oils but for those of you that do, this is definitely one to try. Might also be fun to use for a massage! The 24Hr Refreshing Deodorant (my personal fave from this new range) contains no alcohol or aluminum salts which is perfect because it means no unsightly white marks or staining of clothes. Instead, it's made with starch powder to reduce moisture and smells super fresh. In addition to these two products, there is also a Toning & Exfoliating Gel for a refreshing face wash.
Look for these products exclusively at Shoppers Drug Mart in Canada. im not a fan of oils either but I really wanna try some and see how they work on my skin! love my vit c oil . xO!